The Thomann-Hanry® Restoration team evolved around our façade cleaning business, allowing us to offer a full building restoration package and competitively tender for works which would traditionally be carried out from scaffolding. Thomann-Hanry® have proven to demonstrate the best approach and techniques to use when preserving and repairing historic buildings. We introduce the materials and the processes, with best suitable methods to conserve, repair and restore stone, masonry, statuary and monuments. 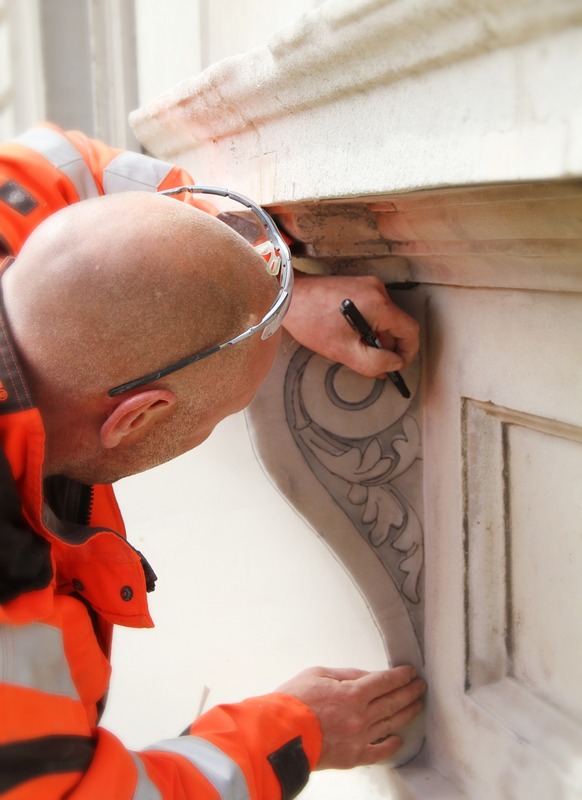 In 2018, the Restoration team has emerged to become a business in its own right, with not only the right personnel, capable of carving, installing and restoring to the highest standards, but also the right facilities. Continued growth requires significant investment and nowhere is our confidence in our Restoration team better demonstrated than in our purchase of a fully certified and industry leading dry extraction system from Italian company Italmecc. Self-cleaning and fully automated, this extraction system removes virtually all contaminants from the air. We’ve coupled this with a silent running compressor from industry leader Atlas Copco, again with world-class filtration, to provide clean breathing air for our air fed helmets. Coupled with good lighting and other initiatives, such as a ban on dry brushing, the workshop annexe at our Park Royal depot is the perfect environment in which to safely cut and carve stone, from corbels and cornices to small indents.